Well Done to everyone today brilliant job time keepers, marshals, signs and racers that all took part. 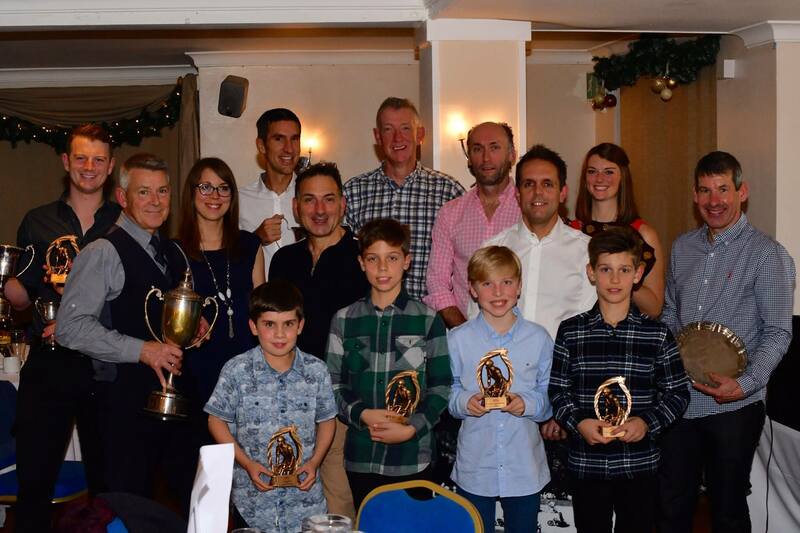 Poole Wheelers celebrated 2018 with its annual dinner and prize presentation at Salterns Hotel on 24th November with lots of members and guests attending. Next year Poole Wheelers will be supporting the local charity, AboutFace, which provides support for patients who have been diagnosed or living with head and neck cancer. Fellow wheeler, Robin Darch, already organised a ride in support on 17th November in aid of this and the club will continue to support in the coming year. Thanks to Les Pick for being master of ceremony and to Ellie Rendell for handing out the trophies. Photographs courtesy of John Pick. Isabel Sharp won the 10-mile National Youth Championship at the RTTC finals staged in Norfolk on Saturday 8th September! Not content with just being National Champion, Isabel also clocked a new the GHS Championship Record… This is an extraordinary achievement from a rider who is still only 13! 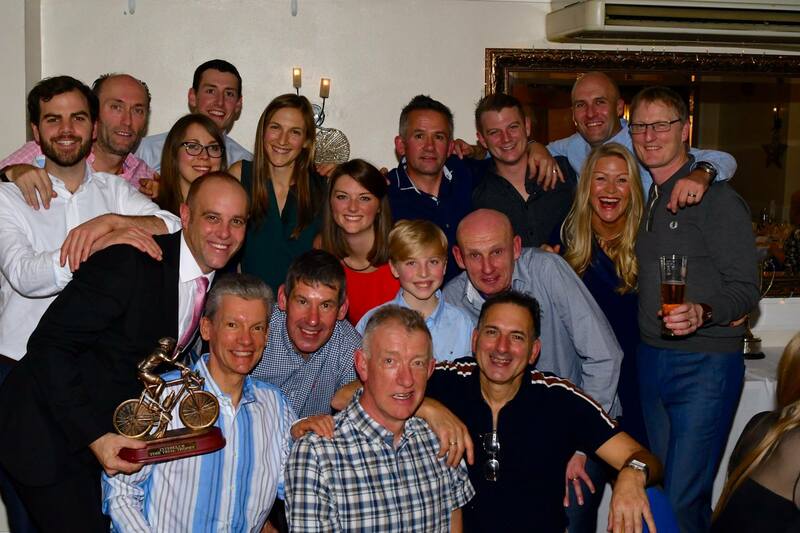 Poole Wheelers also took home the team price with Tom, Jamie and Isabel, who all also won their respective age groups. Their combined winning time of 1:01:52 was also a new GHS Championship Record. That’s a lot of winning! This caps off an extraordinary summer for our youth riders, who have been competing in a range of races in the UK and abroad. 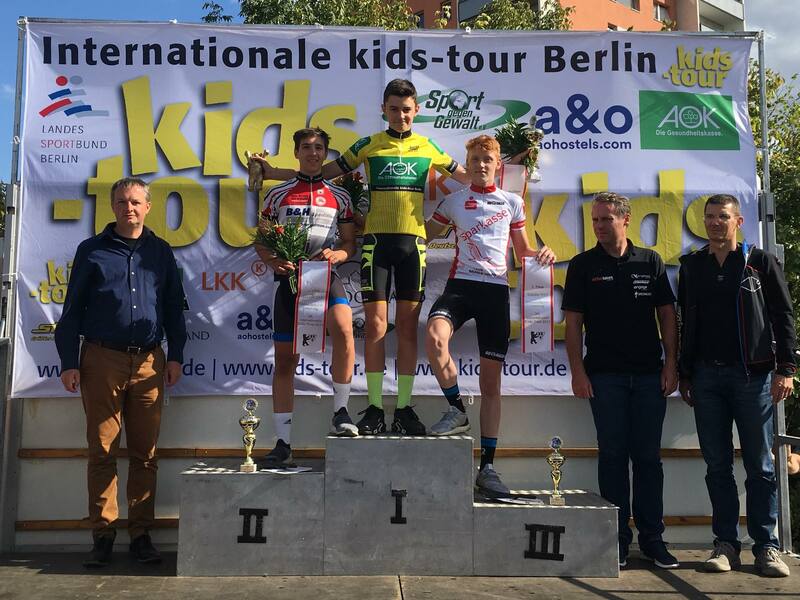 Jamie even won the Kids-Tour Berlin 2018, a four stage race, as part of the international Cannibal Team. After a fantastic performance in individual and Team time trials, a road race and a criterium race, Jamie won the Yellow Jersey and Cannibal Team won the Team Classification! Congratulations from everyone in Poole Wheelers to all our youth riders! It’s been a busy 2017 for the youth riders of the club on the track and road. It all started back in January with the National Icebreakers in Newport. We had many riders competing across the 3 weekends gaining some awesome results showing off the club colours. These riders were Oliver P, Digby, Jamie, Charlotte, Tom and Lucy. The National Youth Circuit Series got under way at Hog Hill. This series carried on throughout the summer months with some riders travelling across the country from London to the Isle of Man, Morecambe and Lancaster, Hillingdon, Stirling and finally Scarborough. Some really tough racing for our riders, gaining huge amounts of experience with Lucy finishing 4th overall against the country’s best U16 Girls. We also had Tom and Jamie travel down to Devon for some regional youth racing both achieving highly each event and doing the club very proud! Easter brought around a few big races for the youth riders with Lucy competing in the Youth Tour of Scotland for the South and then many racing at the Castle Combe Easter Classic. In fact, we had a rider in nearly every age category! April also brought the first of the regional youth omniums in Portsmouth, followed by Brighton and of course Poole Wheelers very own event at Bournemouth Velodrome. Our event was incredibly well organised by Simon and Michelle Pettifer which made for the most enjoyable omnium yet! Thanks again to all the sponsors too! Our riders competing in these included Jamie, Charlie P, Oliver P, Digby, Patrick, Thom-Eidar, Charlotte, Tom, Lucy, Dan, Oliver G, Oliver T, Evie, Ben and Charlie A. For some of our riders it was their first ever race and they sure did everyone proud! Not only was the team spirit high, but the talent was clearly recognised with Jamie, Oliver G, Evie, Lucy, Oliver P and Charlie P all gaining podium spots across the three rounds. Jamie and Lucy earned enough points to qualify for the National Omnium Final at Herne Hill. Both showed the PW colours with strength and determination among the country’s best riders. Throughout the summer we had a number of leagues that our youth riders were attending such as Odd Down, Goodwood, Thruxton, Portsmouth circuits and the Winchester Park and Rides. Winchester Criterium included the Southern Regional Road Championships again this year with storming rides from the youngsters including a podium finish from Oliver G, and a top 5 from Charlie P and Jamie along with all our youths giving it 100%. The summer was a big one for our riders. Lucy and Jamie both competed in the London Prudential Youth Grand Prix at the Olympic Park for the South Team. First time in a team for Jamie and both performing to their best as always. Tour of Assen for Tom, Jamie, Oliver G, Ben, Oliver P and Charlie P gave some great experience in Holland and some of the toughest racing yet! There’s a great article written by Jamie on our website. At the same time as Assen, Lucy was racing in the National Youth Track Championships in Newport, a long draining week but plenty of experience gained each day. As we came to the end of the long season we had the UK School Games finals for Lucy and the rest of Team South. She and the other girls raced brilliantly gaining 3rd overall after the short crit races and 3rd by a fraction of a second in a gruelling team time trial. Lucy herself gained 2nd in the sprints day and 8th in her final youth road race. Our final track race for the youth was for Tom and Lucy in the Inter-Regional Track Championships up in Glasgow. Both doing their bit for the team in a tough weekend of racing. Many of the youth riders have taken part in time trials too over the summer and there are details of those on our Time Trial page. Three riders – Tom, Jamie and Izzy – recently won their categories at the National Closed Circuit competition. So watch this space for further wins. What a year it has been for all our youth riders with ups and downs for everyone. It’s all learning and amazing experience, and a big thank you to all the organisers and volunteers at all the events across the country. And not forgetting Graham our coach and the parents for the constant support and encouragement throughout the season. Thank you! Graham on his track bike at Bournemouth joining in our fun! 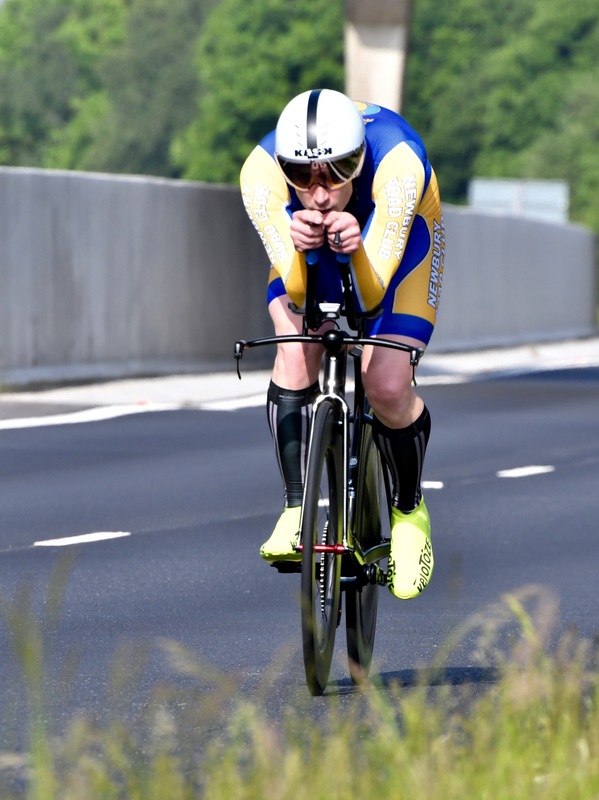 Not content with holding all three club TT records over 10, 25 and 50 miles, Sam Wadsley decided to knock another 22 seconds off his 10 mile record to an astonishing 19:00 at the Paceline RT 10 on the P881r Griggs Green course. After the ride he thanked Greg Parker Cycle Coaching for all his help this season. Sam’s efforts have not gone unnoticed and it was announced earlier today that he has joined Primera-TeamJobs Senior team for the 2018 season! Primera announced “it is pleasure to have such a talented young rider on the team”, and that he is “looking forward to being part of a close-knit team and would love to achieve a top 10 in a national TT event”. Sam will remain in contact with Poole Wheelers as a second claim member of course, and will be joined in the Primera ranks by another Poole Wheelers second claim, Martin Rowland, who in 2017 teamed up with Ryan Weston as UK-Biking – Bournemouth Cycleworks – Trek Cycling Team sponsored riders. Sam has been on a tremendous journey in Poole Wheelers since his first TT on 17th April 2013. Legend has it the young chap turned up to one of our club TTs pleading to have a go. Craig Weston did a 2-up with him to clock in a 27:43 and fondly recalled: “I even said stay on my wheel for 9 miles and with a mile to go ride past me and give everything you have, you lasted about 20 yards before blowing up.” His talent was obvious though, as he finished the season with a PB of 22:47 and joint winner of our Third Division. He won our First Division in 2014, and has won the Premier Division for the past three seasons (2015, 2016, 2017 – last one unofficial / unconfirmed). In 2015 he also won the club’s Rothwell league, and he of course picked up most of the junior trophies on the way. He will be missed by everyone in the club, though fortunately it means someone else will get the chance to feel what its like to lift any number of the club trophies Sam has dominated in the last few years. Best of luck from everyone in the club! You are a giant among men. You can view Sam’s record 10 ride on Strava, and our club records on the PW results website. Featured photo is from one of Sam’s previous 25 mile club record rides. 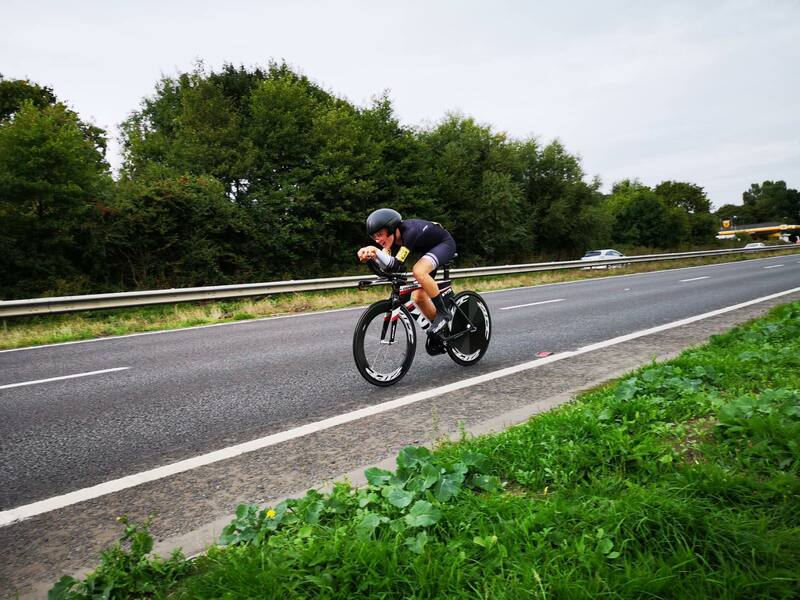 Sam Wadsley continued his magnificent season yesterday by setting a new Poole Wheeler’s club record for a 10 mile time trial, to go with his 25 mile and 50 mile club records set earlier in the season. The new club record is a blisteringly fast 19:22 set on 27th August at the Team Swift Charity Event on the V718/10 course. This is a six second improvement upon the previous club record (19:28) set by late Gary Dighton on our own P415/10 course on 14th July 2013. Sam’s previous PB on a 10 was 19:48 set on the P881R/10 course 14th June earlier this year. Earlier today Sam Wadsley improved his 25 mile TT club record, with a new PB of 49:12! The new club record was achieved on 20th August at the “www.realteam.co.uk (Men)(Chq To M Heritage-Owen)” race, again on the R25/3H course. Full results will be published on the CTT website in due course. This is of course a new personal best for Sam and an impressive 12 second improvement on his previous club record on the distance set at the RTTC National Championship on 6th August. Check out his record breaking ride on Strava. Congratulations, Sam, and keep them coming! 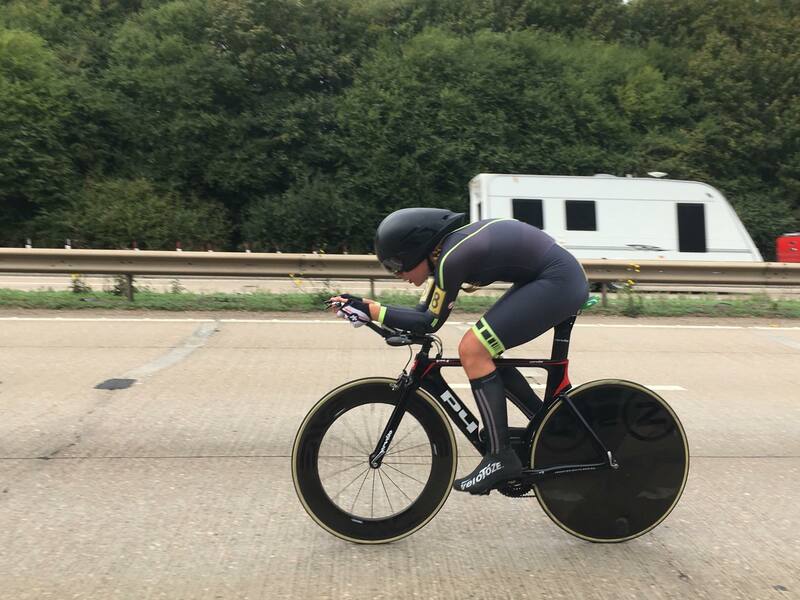 Sam Wadsley set a new Poole Wheelers club record for a 25 mile TT at the RTTC National Championship on 6th August on the R25/3H course. His time of 49:31 means he is the first Poole Wheelers to have recorded a sub-50 25 mile TT (full club stats on our results page). Check out Sam’s record breaking ride on Strava. The club record gave Sam a 40th place overall. Fellow Poole Wheeler, Steven Pink, came in 96th place with a time of 52:49. You can read the full race report and access detailed results on the CTT website.